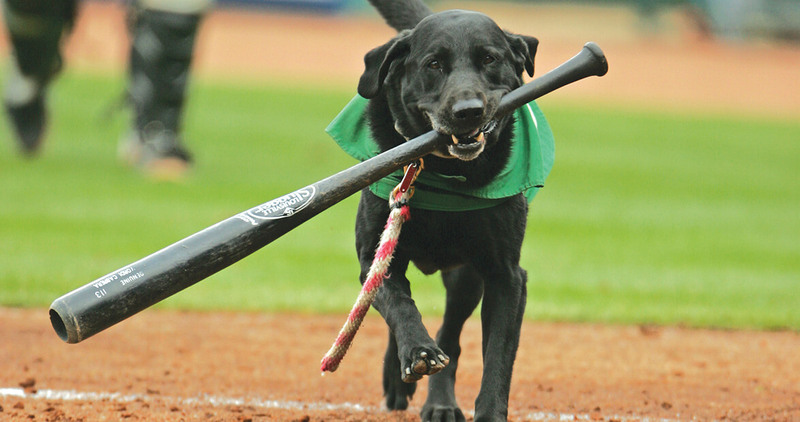 After 10 seasons, a minor league baseball team’s bat-fetching dog is retiring. The bat dog is restless. The first inning’s running long, so Donald Moore, who owns both her and the Greensboro Grasshoppers, is entertaining her under the stands. He throws a baseball. She fetches. He pets her. She scratches her back on a patch of AstroTurf. For more than 600 straight games, this is what Miss Babe Ruth has been up to: hanging out, waiting to take balls to the umpire, to retrieve bats, and to run the bases postgame. The black Lab is now 10. This is her last season. Two understudies, Miss Lou Lou Gehrig and Master Yogi Berra, will take her place. But for now, she has a job to do. After the third out, the gate to the field opens. Miss Babe Ruth grabs a bucket of baseballs, trots out to the umpire, drops the bucket at his feet, gets a treat, and returns the bucket. Innings, like seasons, always end. But Miss Babe Ruth will always be a good girl. As she has since August 2006, Miss Babe Ruth will serve as the Greensboro Grasshoppers’ bat dog at every home game this season. Look for her during the first, third, and fifth innings, and at the end of each game, when she runs the bases. Celebrate Miss Babe Ruth’s retirement at the last Saturday game of the season, on August 29 at 7 p.m.